As I began looking into editing Wikipedia, I noticed that the Twitter Wikipedia page was set to “semi-private,” meaning that if I wanted to edit the page, I would have limited options in the editing process. There were several ways to edit on this page, however, they were not direct like on non-protected Wikipedia pages. If I wanted to, I could have requested an edit change, which may or may not be approved, or I could create a Wikipedia account, have it for at least 4 days, and make 10 edits on other pages. I chose not to edit through either of these options for several reasons. First, I wanted to make an instant edit and with the uncertainty of an edit requested being granted and added to the site, I opted out of this option. Also, I was not comfortable with make 10 edits to other Wikipedia pages. While I’m sure there are plenty of pages I could add insight to, this was not something that interested me. I felt it would be best to make an instant edit rather than waiting for something to be approved. 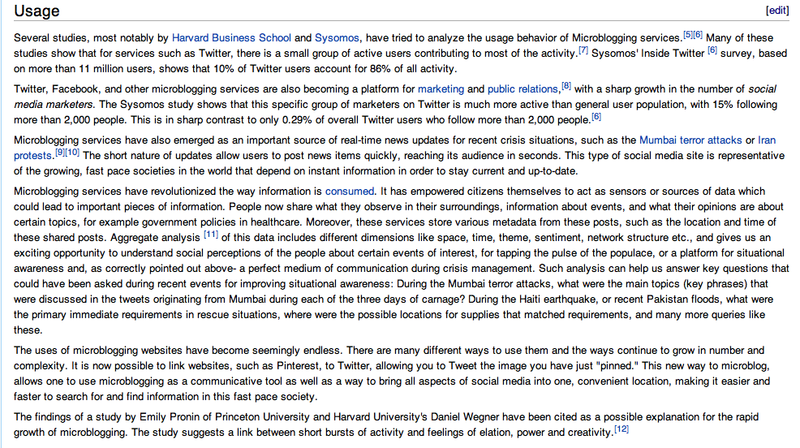 Since editing the Twitter page seemed to no longer be an option, I also decided to edit the Microblogging Wikipedia page. With this edit, I wanted to give commentary to the fact that, while privacy issues remain a concern with social media sites, Twitter in particular has made it easy to privatize your account. It only takes one click of a mouse to set your entire page to private, unlike other sites. With these two edits, I was able to incorporate my own insight into Twitter onto a broad, microblogging Wikipedia page. Whether or not my edits remain on the page and for how long is a different story. Hopefully the information I provided will give at least a few people more insight into the Twitter world and will accompany them while they learn and master the site. The final part of the practicum was to add something to Wikipedia. The “remix” entry on Wikipedia was pretty comprehensive but I was able to add a snippet to the introduction. I had never edited on Wikipedia and to be honest I didn’t know it was as simple as clicking on the edit tab. I don’t know exactly the process they have for approving or taking down added content so I’ll have to see if my addition is still there in a few days. Anyways, like I said the post was already pretty comprehensive, even addressing the copyright implications of remixing, but I added a snippet about how contemporary remixes are often produced in Digital Audio Workstations (DAW’s) which allow producers to reorganize and add various effects to tracks. There wasn’t any other info on the page about the kind of software/hardware that is used to make remixes so I figure I may have a shot in having it kept on the site. I added this to the wikipedia page this afternoon so I don’t know how long it will be visible. As I stated in my Wikipedia post, I planned to log into Chathour, and tell the chat room that I was a researcher and see how they responded. Well, I followed through and did not have much luck. I have attached some pictures to show you what happened in the chat room, but essentially my username is “mkny” and I stated that I was a researcher and wanted to know if anyone could help me out with my research. One girl “nutherBlondee” responded to me, so I assumed she was willing to help out. 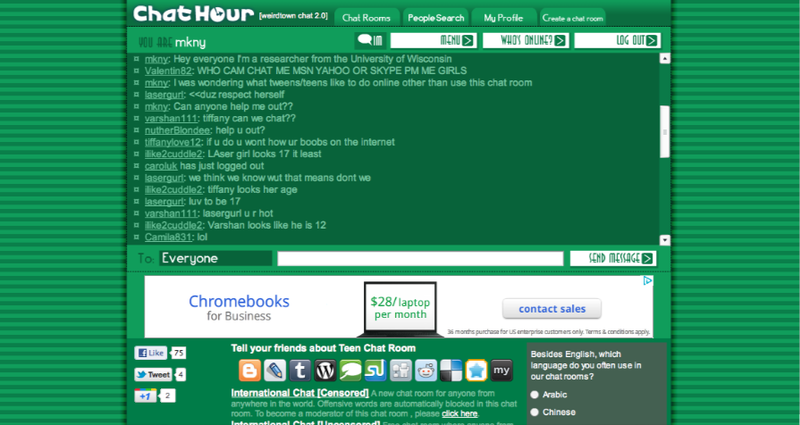 When I “PVT” chatted her within the chat room, she was not at all interested in helping me and claimed she was “buzy.” So..unfortunately I was not able to find out how tweens engage with the internet further than what I saw in chat hour. It was a good effort though! I’ve decided to compare and contrast Facebook with Twitter for this blog post because of the prevalence of both of these sites in my life and others’ lives. Tweets vs. Statuses. Looking at Facebook and Twitter, there are some obvious differences. The length of statuses or Tweets you can publish are substantially different. With Twitter you may only enter up to 140 characters, but with Facebook, there seems to be no limit anymore. If you want to say more in a Tweet, there are ways to do so (which I haven’t figured out, but I’ve seen others do it), or you can always attach a link to another website if you want to show your followers what you are talking about. Followers vs. Friends. This is pretty self-explanatory. On Facebook, you have “Friends.” On Twitter, you have “Followers.” They’re essentially the same thing with different names. Profiles. Facebook is based around a personal profile. You upload videos and photos and include information about your school, job, interests, hobbies, etc. on the “Info” page. You write on your friends’ walls and comment on their photos, videos, posts, etc. On Facebook, there are so many ways to connect with friends and share information about your personal life (besides just posting statuses). On Twitter, your profile is less informative. You may include a 160-character description of yourself, if you choose, and this will appear below your name on your Twitter page (see image below). Mine says “Kappa Alpha Theta. ON WISCONSIN!” This includes very little information about my personal life, unlike my Facebook that states my school, favorite movies, where I work, and many other things. It is much more difficult to find out personal information on a person’s Twitter unless they Tweet that information, but even then, it’s not plastered on a separate page, like it is on Facebook. Privacy. Compared to Facebook, Twitter privacy settings are incredibly easy to use and understand. With just one click, you can set your Twitter to private (see image below). When it is set to private, you must approve of who may follow you. I have decided to keep my account public in order to gain more followers (I’m up to 76!). On the other hand, Facebook privacy settings are incredibly detailed and often times difficult to understand. You can customize your privacy settings, keep some things public and others private, etc. There are so many ways to adjust your Facebook page that, to me, it seems overwhelming. Overall appearance. I’ve found that there is more room for creativity on Twitter than there is Facebook. 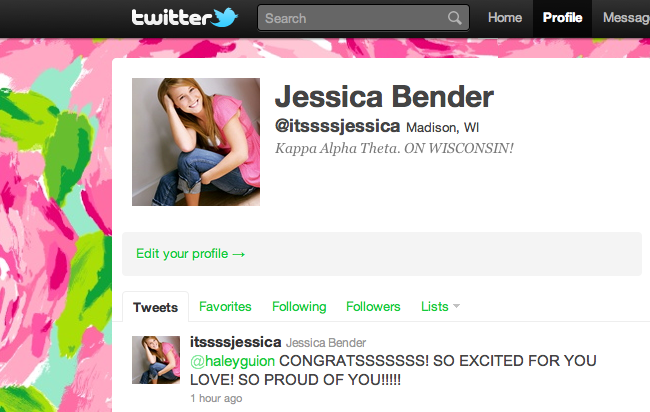 I’ve had a fun time changing the background and text colors of my Twitter to show off more of my personality. I figured out how to upload my own background image and edit the text colors to match. Twitter also supplies several basic background layouts for people who may not want to deal with editing the look of their page. I think in this sense, since Twitter doesn’t reveal as much of your personal identity as Facebook does, this is a way to show who you are and what you are interested in without explicitly stating it like on Facebook. 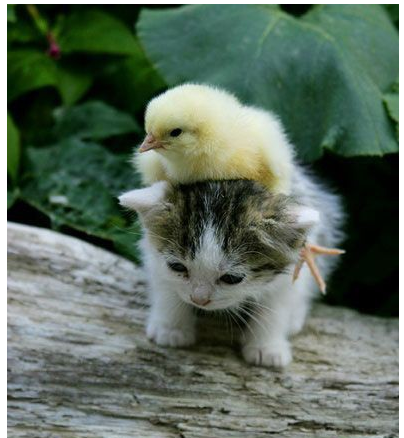 Overall, there are many differences between Facebook and Twitter. I like each for various reasons – Facebook allows you to share and look through thousands of photos on friends’ pages and Twitter keeps everything short and sweet. However, when it boils down to it, they are both social networking sites that have attracted millions of people and allow us to connect with friends, family, celebrities, and others. As I’ve become more of an expert with Twitter, I’ve begun to use it as a way to communicate and link to other things that I am doing. One way I have been doing this is by linking my Pinterest account with my Twitter account. Pinterest is a type of social networking site in which you follow other users and “pin” pictures onto design and inspiration boards. 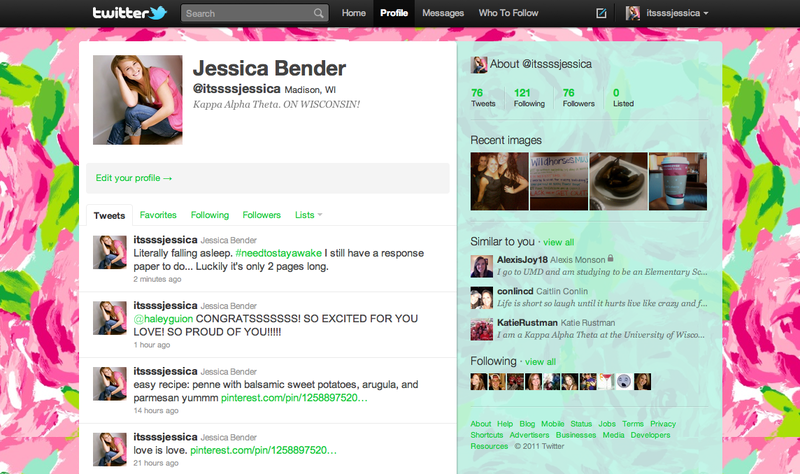 I’ve recently become addicted to this site and have been using Twitter to show it! 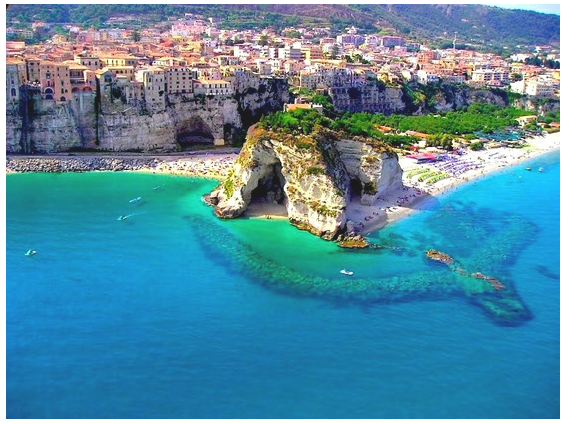 This is a photo that I found and re-pinned onto my “Places to See” inspiration board. I used Twitter to show all of my followers what I had been doing on Pinterest and to spread the word about a new website I had found and become so obsessed with. Twitter has really become a way for me to connect all the different aspects of my life. I keep in touch with friends, relay messages about what I am doing (in under 140 characters, of course), stay current with local and national news, catch up on celebrity gossip, and show what I am up to or thinking about by linking my Twitter to other websites, such as Pinterest. This is certainly something that other websites, such as Facebook, have been doing for a while. However, it’s fun to just give a short snippet of information regarding what you are linking your Twitter to and leaving it up to your followers to find out what you are up to. It’s a great way to connect every aspect of my life and bring it all into one, easy and convenient location. Like I’ve said before, although Twitter only allows you to communicate small and brief amounts of information at a time, it is extremely useful for staying current in all aspects of my life without having to take the time to search for everything elsewhere. And now that I’m able to add more of myself into my Tweets by showing exactly what I am interested in by linking my Twitter to other pages (or adding a link I have found into a Tweet), I can really keep my followers up to date on everything going on in my life, keeping them informed on just what I am interested in. As I’ve been using Twitter more and more frequently, I’ve really come to love the fact that everything I need and want is all in one place!